When people say they miss the genre movies of the 1980s, what exactly do they miss? The bold-faced earnestness? The clear heroes and villains? Or maybe the way that Hollywood blockbusters and straight-to-video fare were equally invested in catchy ideas that sounded awesome on paper but often came out dated and cheap? 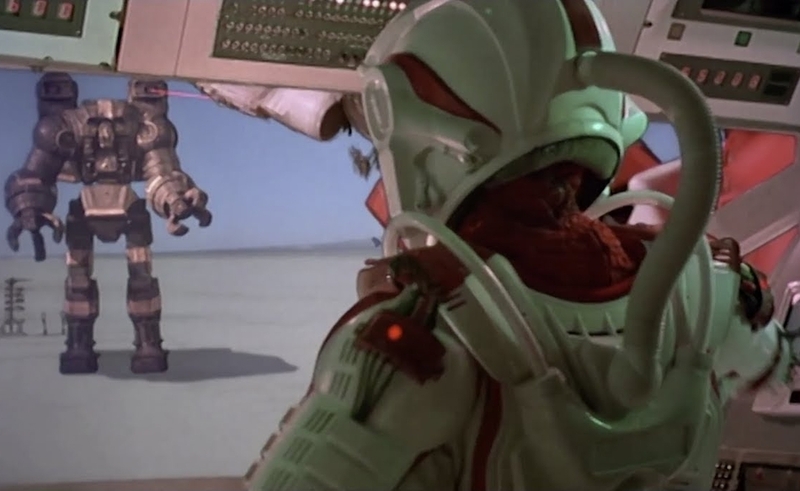 Director Stuart Gordon’s Robot Jox was released in 1990, though the shoot was actually completed in 1987, with the three-year delay due mostly to the financial woes of its production company. The movie is thoroughly 1980s regardless, to the extent that it was already a relic by the time it hit the big screen—which wasn’t long before it hustled its way onto VHS. Even beyond the cartoony violence and moussed-up hair, Robot Jox’s story of a post-apocalyptic Earth where the U.S. and U.S.S.R. are still scrapping (under the names “The Market” and “The Confederation”) is the product of a Cold War that was already thawing when the picture snuck into theaters. But why sweat the ahistorical stuff when there are giant robots fighting each other with projectile-fists and crotch-saws? In Robot Jox, Gary Graham plays Achilles, a Market robot-pilot who’s a champion in the organized gladiatorial matches that the world of “the future” uses to settle political disputes. When a suspicious mid-bout accident causes the death of hundreds of innocent people, Achilles has to pull himself out of a funk to defend the honor of the program, and to keep a few nefarious individuals from subverting the system through sabotage and secret back-room deals. Achilles’ comeback gives a conventional “hero’s journey” grounding to a movie that’s otherwise ahead of its time, falling somewhere between RoboCop (which came out while Robot Jox was in production), The Hunger Games, and Pacific Rim. The problem with filmmakers being out in front is that they hit the hazards that the ones behind them avoid. In the case of Robot Jox, that means that just about everything in the movie that’s not bot-combat is almost unbearably dopey. Gordon—best-known for his delightfully perverse B-horror pictures—came up with the story for Robot Jox, then hired respected science-fiction writer Joe Haldeman to pen the script. But Gordon kept resisting Haldeman’s attempts to make the material more serious, and instead just used the dialogue and plot to fill space between the comic-book action, making a quasi-political movie with very little of the satirical underpinnings of something like William Klein’s Mr. Freedom (or his own Re-Animator). Gordon’s saving grace is that the stop-motion animation and model work on Robot Jox looks really cool, even now. In a way this is the original live-action Transformers movie, but with more handmade charm than the current franchise. The 1986 skateboarding melodrama Thrashin’ is a very different kind of 1980s movie, though like Gordon’s film it could fall under the category of exploitation, because the filmmakers knew what their audience wanted and didn’t mind indulging it. In Robot Jox, the hook is “giant machines kicking the crap out of each other.” In Thrashin’ it’s skateboarding: the culture, the tricks, the equipment, and the California dudes. There’s almost no plot to this skate-pic. Josh Brolin plays ace boarder Cory Webster, who comes to stay with some buds from the Valley, and gets thrust into their longstanding rivalry with some Venice Beach punks called The Daggers. The trouble intensifies when Cory starts dating Chrissy (Pamela Gidley), the sister of Dagger-leader “Hook” (Robert Rusler). The squabble between Cory and Hook plays out across organized half-pipe competitions, illegal “jousts,” and a climactic downhill race. A lot of what’s entertaining today about Thrashin’ is inadvertent. Director David Winters and screenwriters Paul Brown and Alan Sacks (the latter of whom also produced) had no idea that in 2015 Brolin would be an Oscar-nominated star who’d appeared in a few of the best films of his era, and that there’d thus be some interest in seeing him play a teenage skate-rat. They probably weren’t even aware that Thrashin’s glancing depiction of the Los Angeles punk scene—evident in a couple of SST Records T-shirts and a badly lip-synched performance by a young Red Hot Chili Peppers—would be more relevant now than the film’s hackneyed post-John Hughes star-crossed-lovers plot. But with both Robot Jox and Thrashin’, the general guilelessness is appealing. These movies were financed and marketed because they promised to meet very simple needs. Like too many movies, Thrashin’ is robot-poor, but if a middle-American teenager in the late 1980s wanted to see good-looking young folks build a giant ramp in their backyard and do spectacular mid-air twists, then the local video store could satisfy that fantasy, too. Olive’s Thrashin’ Blu-ray is extras-free, but Scream! Factory’s Robot Jox disc comes fully loaded, with two commentary tracks and an assortment of interviews. As with a lot of the Scream!/Shout! sets, the craft-focused behind-the-scenes material is well-pitched, justifying fans’ affection while giving newcomers a frame of reference for an honest assessment and appreciation of what Robot Jox is. It’s hard not to share at least some of Gordon’s enthusiasm when he says that he made this movie because he loved Japanese giant-robot anime, and wanted to see the live-action version that didn’t exist at the time. That’s so often the difference between good trash and bad trash—whether the intentions were cynical or sincere.